Luczon Brokerage Company, LBC in short, is a Philippines based Courier Company that was founded in 1945. According to a 2009 report, LBC owns and operates a little over 1000 branches in Philippines alone, approximately 60 in the United States and Canada, and several other branches in countries like Germany, Japan, Malaysia, China, South Korea, Spain and Singapore. The company offers several shipment services, which we will discuss shortly, as well as an LBC package tracking feature that will help you check the status of your parcel every step of the way. If you are having troubles with LBC package tracking or shipments, we will guide you through the entire process. Be warned, however, that several complaints have been made regarding the services of the company. Some customers reported missing items, incomplete deliveries, or no deliveries at all. We also experience several problems while accessing the official website, which seems to have some annoying bugs. The LBC package tracking system was changed a few years ago, and it seems that it is still posing minor difficulties to customers. With this in mind, let’s take a closer look at the carrier’s services. LBC ‘Track and Trace’ feature: without a doubt, one of the quickest ways to check on the status of your consignment is by using the Track & Trace feature which can be found on the company’s official website, on the top toolbar. If you are accessing the LBC site for the first time, make sure to enable the location tracking feature that appears in the pop-up menu (not enabling it might result in minor bugs). You can change your location manually from the widget. 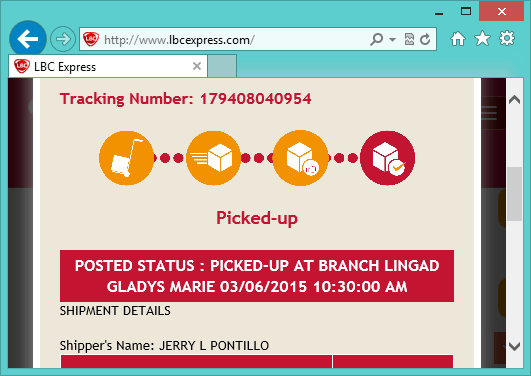 Click on the LBC package tracking option and a new pop-up will appear that will request your tracking ID. Click on “Trace” to pull-out information about your parcel complete with updates and timestamps. For each status update you can click on shipment details to find out more data such as time of arrival, address, date etc. SMS Tracking: if you’d rather receive status updates on your phone all you have to do is to key in and send the following message: “LBC <space> TRACK <space> *TRACKING NUMBER*” (example: LBC TRACK 194031923951) to This service is available for all networks, and it will automatically prompt you through a text message every time the status of your package changes. Alternative online LBC package tracking options: if the company’s website is giving you headaches you should know that there are other ways to track your package. For example, DHL has set up a convenient tracking tool specifically for LBC. Type in your tracking code and the web-based tool will do the rest. You can also use Aftership or ProPackageTracking’s tracker to check on your parcel’s tracker. Keep in mind that these providers cannot be held responsible for delivery issues, and they will not contact the company on your behalf. They were only designed to help you with the LBC express package track process. Social Media: if none of the above methods work, there is one more option – contact the company directly through its Facebook or Twitter Someone is bound to reply to you if you leave a comment or message on a social media account. LBC has set-up a nifty shipment delivery schedule option which can be accessed from the official page’s header. If you do not specify your desired time of arrival, the package will be delivered normally. For domestic shipments you will have to wait a maximum of two business days for provincial destinations. International packages are sent through Air and usually take around 7-10 business days to arrive. While this process is lengthier, it definitely undercuts competition in terms of prize by at least 50%. In special situations, LBC will also deliver parcels on Saturday. To receive parcels on this day please select the LBC Priority Overnight service with Saturday delivery option. Besides the LBC package tracking options featured above, the company doesn’t offer any additional or enhanced features. If you lose your tracking number for the package you can use online tools to determine LBC transit times, or contact a customer care representative to have the receipt resent to you. LBC’s shipment services are divided into two major categories: LBC ground for routine & low-cost shipments, and LBC Express for heavier, sensitive packages. Features include, but are not limited to Sea Cargo, DKilobox/Balikbayan Box, N-pouch/X-pouch, N-pack/X-pack, bills express, Instant Pera Padala. Browse the official site for more detailed information about services. What can you do if the LBC Package Doesn’t Arrive on Time? And hows the price comparing to the normal balik bayan boxes? Can i arrange or set a time for the delivery of my shipment? Hey Buddy!, I found this information for you: "LBC Package Tracking Tips & Tricks". Here is the website link: https://all2door.com/lbc-package-tracking/. Thank you.